Stephen F. Austin State University's Arthur Temple College of Forestry and Agriculture entered into a partnership with Beihua University, located in China's Jilin Province, with the goal of international research and collaboration across the disciplines of environmental science, forestry and spatial science. Pictured standing from left are Dr. Matthew McBroom, associate dean of SFA's Arthur Temple College of Forestry and Agriculture; Dr. Hans Williams, dean of the Arthur Temple College of Forestry and Agriculture; Dr. Steve Bullard, provost and vice president for academic affairs at SFA; and Dr. Qingfan Meng, dean of Beihua University's College of Forestry. Seated from left are Dr. Zhan Liping, vice president of Beihua University and Dr. Steve Westbrook, SFA interim president. NACOGDOCHES, Texas - Stephen F. Austin State University's Arthur Temple College of Forestry and Agriculture has entered into a partnership with Beihua University, located in China's Jilin Province, assuring further opportunities for international research and collaboration across the disciplines of environmental science, forestry and spatial science. 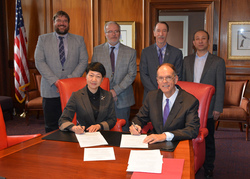 "The relationship will be mutually beneficial through study abroad opportunities, graduate student exchanges, faculty interactions and research collaborations," said Dr. Hans Williams, dean of SFA's Arthur Temple College of Forestry and Agriculture. For more information on this partnership and additional activities, visit atcofa.sfasu.edu.